Liftoff of NOAA’s Geostationary Operational Environmental Satellite (GOES-S), the second satellite in a series of next-generation weather satellites, carrying technology created by scientists at UNH. Photo credit: NASA/Kim Shiflett. Lift off! State-of-the-art space weather instruments developed by researchers at UNH’s Space Science Center are now heading into space. The equipment was aboard the GOES-S satellite mission, the second in the Geostationary Operational Environmental Satellite R-series, launched March 1 at 5:02 p.m. from Cape Canaveral, Florida. The technology is part of a suite of weather instruments created specifically for the highly anticipated new National Oceanic and Atmospheric Administration (NOAA) weather satellites that will provide more accurate weather forecasts and warnings. Involved in space research for six decades, UNH has contributed instruments to more than 30 satellites. The UNH researchers were chosen to create, build and calibrate a sensor that will allow scientists to monitor over long periods the level of energetic ions, from protons to nickel, that populate the near-Earth space environment. These ions are the main cause of high levels of radiation that can affect everything from communications and GPS satellites to commercial airlines and even astronauts. 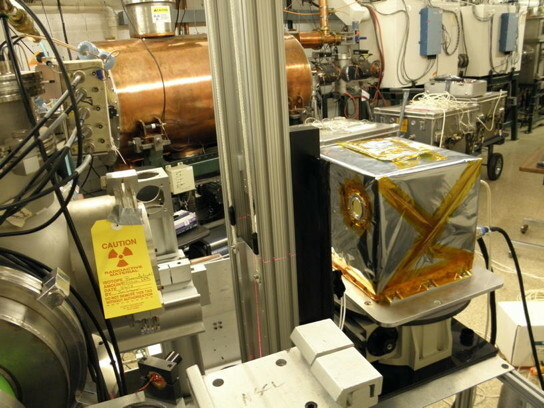 Energetic Heavy Ion Sensor (EHIS), a space weather instrument designed, built and calibrated by UNH for the GOES-R weather satellite. The team of UNH engineers constructed the sensor to specifically measure atomic nuclei in space from helium, through the more massive carbon, nitrogen and oxygen, and the very massive iron and nickel. Like the rest of the universe, the large majority of positively charged particles in space are protons, followed by helium, then the heavier elements. Monitoring these particles will be an integral part of the NOAA Space Weather program that tracks and forecasts changes in the environmental conditions in space around the Earth. The GOES series of satellites, NOAA’s biggest satellite advancement to date, will provide National Weather Service forecasters the meteorological equivalent of going from black and white to ultra-high-definition color TV. Similar to the first satellite launched in November 2016, this new satellite will scan the Earth five times faster at four times the image resolution, with triple the number of channels for more accurate, reliable forecasts and severe weather outlooks. Once the satellite is declared operational late this year, it will provide faster, more accurate data to track storm systems, lightning, wildfires, dense fog and other hazards that threaten the western U.S., Hawaii and Alaska.